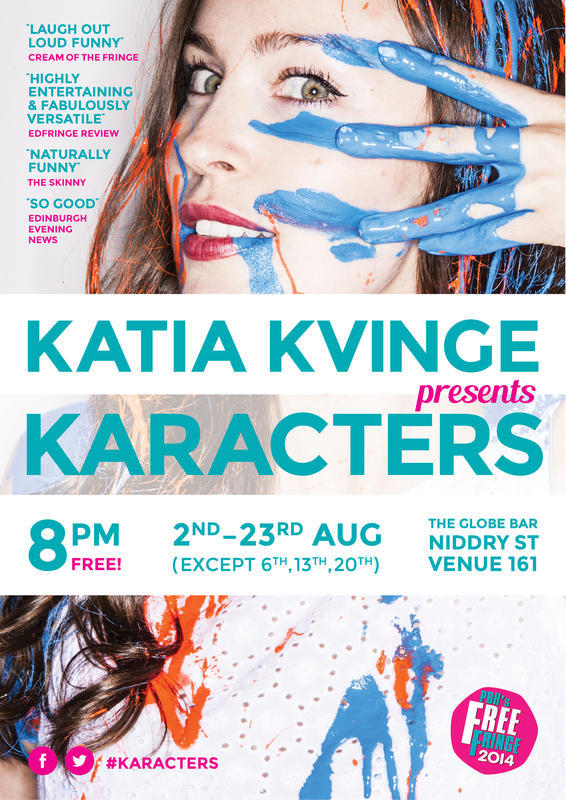 Katia Kvinge is a Scottish BAFTA New Talent Award Nominated stand up comedian, actor and sketch performer. As seen and heard on Netflix, BBC Three, BBC Scotland, BBC Radio 4, Nickelodeon, MTV and Comedy Central. After graduating with a BA Hons Degree in Fine Art from Edinburgh College of Art, she trained in Acting and Clown with Philippe Gaulier (Mentor to Sacha Baron Cohen). She is currently in the Los Angeles Second City conservatory and in The Groundlings & Upright Citizens Brigade (UCB) Advanced Levels. She performs fortnightly with London based Improv teams ‘Sweet FA’ and ‘Ladies of FA’ at The Free Association. After 2011- 2013 saw her complete sell out runs in The Edinburgh Revue Sketch Show, in 2014 & 2015 she brought her critically-acclaimed, one woman comedy shows “Karacters” & “140 Karakters” to the Edinburgh Fringe. Then returned in 2016 with her sell out, five star show “Squirrel”. She will be returning to Edinburgh in 2019 with her new show ‘Fringe Winge Minge Cringe’.